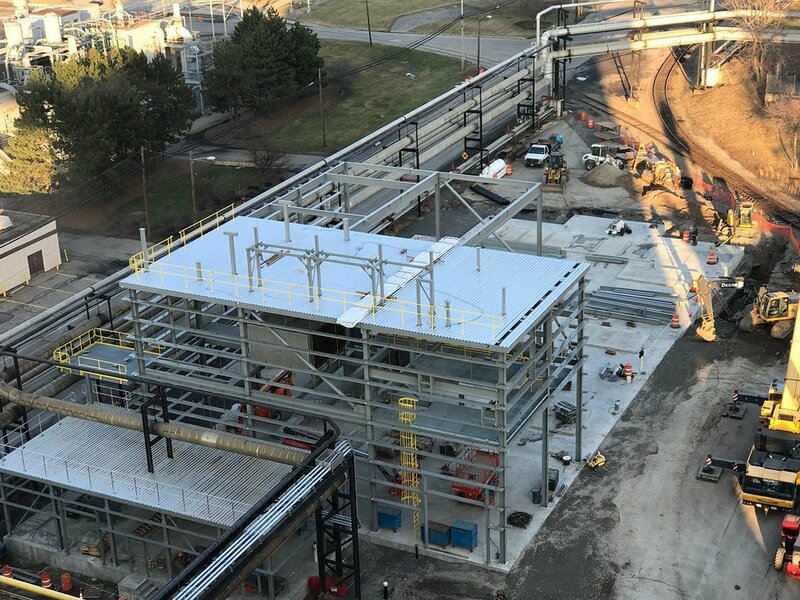 The last few weeks has seen significant progress on the RED-Rochester project to convert Eastman Business Park from coal to natural gas energy. This on-going project is designed to eliminate emissions of sulfur dioxide and greatly reduce other emissions to become more environmentally friendly and promote sustainability. 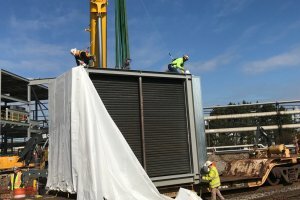 Specifically, on the B-371 construction site, the #45 boiler economizer was delivered by tractor trailer and is in place on the second floor. Steel work has also continued on B-371, creating a significant change in the structure. A metal roof has been put down on #45 boiler section, as well as pipe supports, hand rails, ladders and some grating has been put in place. In addition to the #45 boiler, the 3 Victory economizers arrived by rail at Eastman Business Park in mid-February. The economizers arrived on flat bed rail cars, each on a separate car. 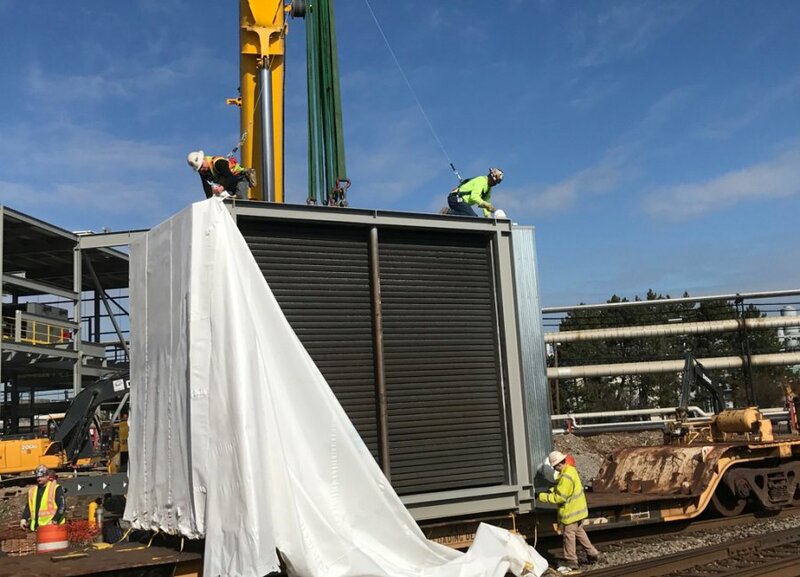 They were brought over to the rail spur on the south side of B-371 and a crane was brought in by Hohl that was capable of off-loading each of the 129,260 pound economizers. The economizers were each initially placed on the pavement between B-371 and the rail road tracks. The #46 and #47 economizers have since been moved to the concrete foundation for their respective boiler. 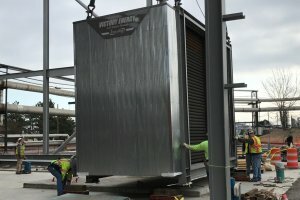 Steel will be put up in each boiler bay working around the economizers until there is enough steel to lift them into place. This steel work has started in the #46 boiler bay. While all of this work has been going on, on the south side of the B-371 construction site, the fire main is also being installed on the foundation, from the west roadway tie in. Both crews have been doing a great job of working together without interfering with work being completed. The fire main has been run to the southeast corner of the foundation. This job included putting a “T” in the existing fire main line on the west side of B-371, installing a new manhole for the fire main shut off valve and running the line along the south side of B-371 foundation. This will go around the east end of B-371 and tie into another existing fire main on the north side, to supply a double feed. 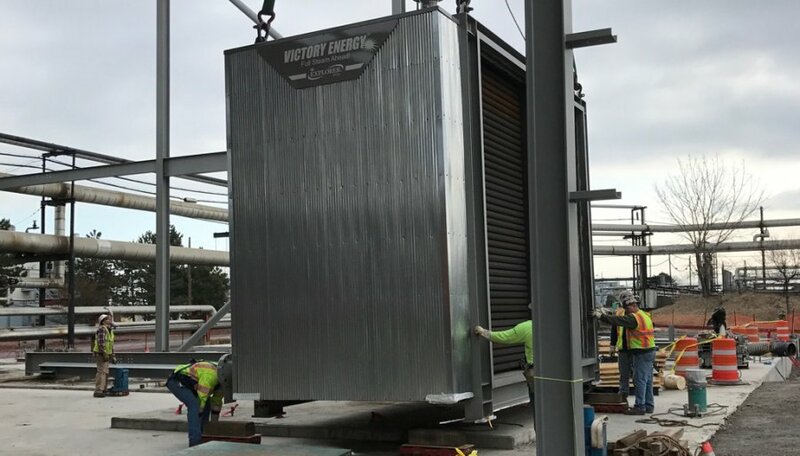 Electricians have started pulling wire to the new Natural gas skids for #44 boiler which is inside B-321, one of the boilers remaining after the site is converted to natural gas. They have also completed the conduit to B-371 from B-321 and will soon start pulling wire. The electricians have also been installing the grounds on the fire main piping as it has been installed. Finally, pipe has started to be taken from the laydown area to the Danforth shops in Victor and Buffalo for fabrication. 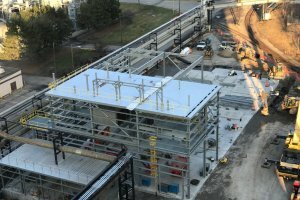 This significant work is keeping the Eastman Business Park gas conversion on track in effort to be completed on time. Check back often as we continue to add updates on progress made and on-going improvements.